Today is a big day for baseball. Stephen Strasburg makes his debut with the Washington Nationals against the Pittsburgh Pirates. The game will be shown on the MLB Network tonight and I'm betting every baseball fan in the country will be tuning in. However, there is more making this an exciting day for baseball. Michael Stanton will be making his major league debut with the Florida Marlins. The only fans not watching Strasburg tonight will be Stanton's fantasy owners who are tuning into Stanton's debut against the Philadelphia Phillies. Stephen Strasburg has thrown 57.3 innings with a 2.04 FIP in the minors. He is not just a strikeout pitcher. In addition to his 10.20 K9 (combined Double-A and Triple-A) he also owns a 64.9 groundball percentage. He's probably been ready to pitch in the majors for more than a year. But without his stint in the minors his first MLB start would not have nearly the impact on baseball and Washington Nationals that it will tonight. I expect him to pitch well. He won't necessarily be Tim Lincecum right off the bat. He will be facing the very best hitters in the world now. Even the Pirates are better than anything he saw in the minors or in college. In 189 at-bats in Double-A, Stanton has hit .312/.443/.730 with a .328 BABIP. He has nice batted ball splits, more than 50 percent of his batted balls are fly balls. He kills lefties but does not have handedness issues. He has hit much better at home than on the road. This has led some to believe he is the product of a nice home environment but I don't buy that and neither do the Marlins. He could probably do with a little time at triple -A (and hell, he may still get it) but I think he will hit for a decent batting average and tons of power. He is still available in a lot of leagues. You should pick him up right now, you may not have the chance again. The draft continues today. You can check it out in progress at MLB.com/live. Yesterday had a few surprises including Bryce Harper being announced as an outfielder rather than a catcher. The Chicago Cubs went their own way by drafting Hayden Simpson. Zigging when they Zag has been the habit of Scouting Director Tim Wilken. Tim described the kid physically as a cross between Roy Oswalt and Tim Lincecum while acknowledging he has a long way to go to reach that status. Like Lincecum, Simpson said on a conference call tonight that he uses his whole body to pitch, easing stress on the arm. The 21-year-old Simpson was 13-1 this year with a 1.81 ERA in Division II ball. Simpson said his best pitch is his slider and that he also possesses a four-seam fastball, a circle change and a 12-to-6 curveball. The New York Yankees stunned many by drafting high school shortstop/RHP Cito Culver with the 32nd pick of the draft. He is an okay prospect. He was just picked about 100 names earlier than anyone expected. On the mound, he was 90-91, which really isn’t bad for a guy with that kind of frame. What you didn’t see with Culver was a lot of physical projection for height, which would make his future as a right-handed pitcher pretty nominal. On one play, a kid fouled a pitch back behind the screen. Culver came off the mound, full speed, and caught up to his catcher deep in foul territory. It was a throwaway play to some scouts, but it showed me reflexes, his first step and his acceleration. The guy is an athlete. One of my favorite picks of the draft went to the Atlanta Braves. 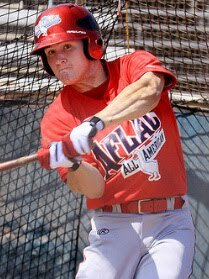 Scouting Director Tony DeMacio selected Matt Lipka, a high school shortstop from Texas. The Braves project him as their future leadoff hitter. When DeMacio went to suburban Dallas' McKinney High School last month, he was thoroughly impressed with the cerebral approach taken by an athletic shortstop whose will to win complimented the speed that had made him such a threat as a leadoff hitter and two-time Class 4-A All-State wide receiver in the football hotbed of Texas. Thus when it came time for the Braves to make their first selection, the 35th overall, in this year's First Year Player Draft on Monday night, DeMacio confidently selected Matt Lipka, the 18-year-old shortstop who had developed into one of the two multi-sport superstars that made McKinney High a popular destination this past year for college-football recruiters and baseball scouts. "He's a kid that's going to show up for you every day," DeMacio said. "He's going to make everybody else better around him. He's a winning-type guy. He's just a great, great young man and we're just very pleased to have him."